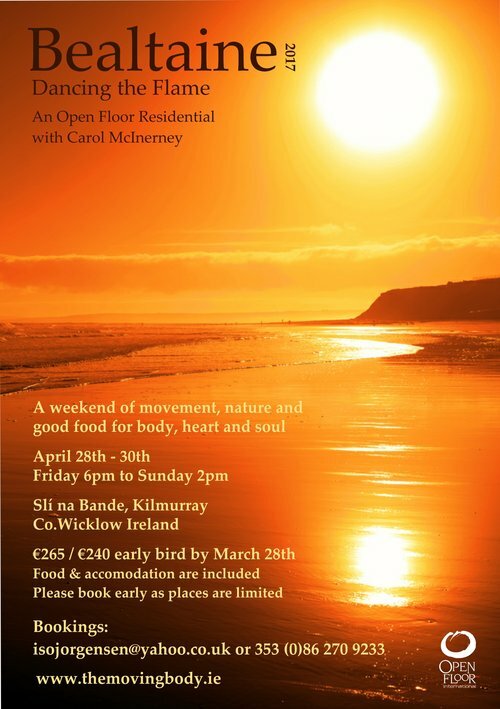 At Bealtaine, as the growth cycle turns towards summer, this is an opportunity to take some time out to relax, to move, to listen, to dance and to enjoy nature in the beautiful surroundings of Slí na Bandé. This time of year is one of transition, where the life giving and refreshing energy of the sun is climbing higher in the sky and moving towards solstice. The element of fire, embodied by the sun, is a deeply healing force, that can purify, renew and nourish us on every level. 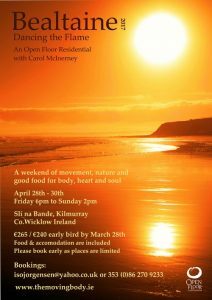 Supported by Open Floor Movement Practice we will take time to connect within and with each other, inviting curiosity and compassion as we explore the range and various expressions of our fire; from the cool flame of mindful awareness to the heat of our passion and creativity. Accommodation, tasty organic food and outdoor hot tub option are included in the price !